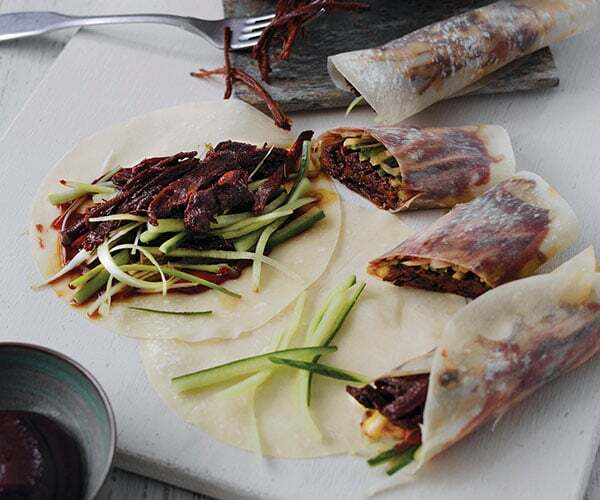 You can either serve all the ingredients separately to let everyone enjoy making their own pancakes (as pictured), or you can make up the pancakes beforehand by placing a little of the meat onto the pancake and topping it with the sliced cucumber and spring onions. 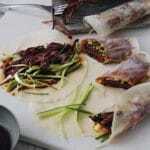 You can also serve the pancakes with a splash of the Hoisin sauce. Mix all the marinade ingredients together. Place the meat into the marinade, making sure it’s fully coated. Leave in the fridge overnight to marinate. When the meat is ready to cook, you can prepare it in two different ways. Either cook it on the stove; put everything into a pan, bring to the boil and simmer on a low heat until the meat is soft. It can take a long while for the meat to be tender (approximately 2 hours). Or, put the marinade and meat into a vacuum-pack bag and cook in a water bath at 74°C overnight or until tender. Once the meat is cooked, drain off any remaining liquid and, while still hot, pull the meat into thin strips. Discard any bones but keep the leftover marinade – you will need it later. Now, onto the sauce. Take the marinade, bring it to the boil and reduce by half, until it’s nice and sticky. It should be thick enough not to drip off the pancakes but still coat the meat nicely. Cut the cucumber and spring onions into thin strips and place in two separate bowls. Warm the pancakes by steaming or in a microwave – it should only take seconds. Place the pulled meat into the reduced marinade and mix gently so that the meat is neatly coated. The marinade can be quite strong, so make sure to pour enough of it to suit your taste. Place meat into a serving bowl.